There are many industries which can create the particulate matter in the process of manufacturing, and then it releases the gases as well as dust into the environment. When it releases the particulate matters in the environment then that causes the reduction of particulate visibility, and that can lead to climate change, health issues like bronchitis and lung infection. Fine elements are lesser than 0.0001 inch or 2.5 microns in length and that can be particularly hazardous because they can cause inflammatory reactions and lungs infections. To overcome these problems there is a solution namely electrostatic precipitator (ESP) which can be used to remove the particles, impurities in the air. What is an Electrostatic Precipitator (ESP)? Electrostatic Precipitator can be defined as a type of air cleaner or filter that utilizes electric energy for removing the impurities, dust particles from the air. This is a commonly used device for controlling air pollution. Most of the industries, power stations generate fossil fuels in the process of electricity generation or manufacturing process. When these fuels burn, then the smoke will generate which includes the small soot particles that are balanced the air. The carbon particles which are not burned can pull out from the smoke with the help of electrical energy in the precipitator. It is essential for removing carbon particles from the burn because it can harm human health as well as properties like buildings. This device includes two sets of electrodes namely positive as well as negative. The appearance of the positive electrodes is like plates whereas the negative electrodes are in the shape of a wire mesh or rod. These two electrodes are arranged vertically one after another in the precipitator. The connection of the two electrodes can be done by connecting the positive and negative electrodes to the two terminals of the DC source. The DC source positive terminal may be connected to GND for getting strong negativity to the negative terminals. The distance between the two electrodes and applied DC voltage are corrected. The components of electrostatic precipitator include Electrodes, 3 phase supply 50 Hz 440v, control cabinet, High voltage transformer, Rectifier, Hooper and Insulators. The control cabinet is applicable for interconnecting the transformer & 3 phase ac supply using wires. The function of a transformer in an electrostatic precipitator is for step-up & step-down the voltage. The main function of a rectifier in an electrostatic precipitator is to alter the AC supply into DC supply. The hooper is useful for storing the particles of dust & content of ash from the electrostatic precipitator. The electrostatic precipitator working principle is very simple. The unclean flue gas flowing through the tube is supplied by two electrodes. The shape of the two electrodes mainly depends on the type of precipitator employed like bars, plates, metal wires, etc. 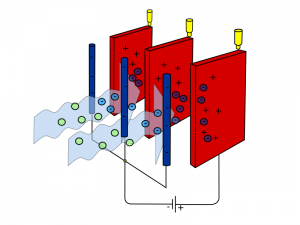 One of the plates is charged by a high negative voltage, which causes particulates in the burn for getting a negative charge because they flow with this plate. 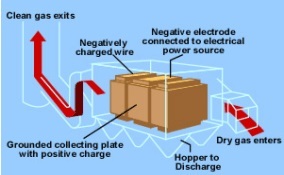 The next plate carries a high positive voltage equally, due to the fact that opposed charges attract. The soot elements which are negatively charged are pulled in the direction of the positive electrode & fix to it. Irregularly these two plates should be cleaned for eliminating the collected dust. Most of the electrostatic precipitator’s works in the same method, and there are several dissimilarities as well as types that work well for different amounts of pollution, shaped particles, and smoke compositions. At present, the applications of ESPs have become very standard in several industries because of severe instruction as well as ever-growing air-pollution. Fixing one ESP has become a necessity in a power plant where chimney gases are out. However whether ESPs execute the function estimated from them will be decided by calculating the device efficiency. The efficiency requirement can depend on the type of industry. 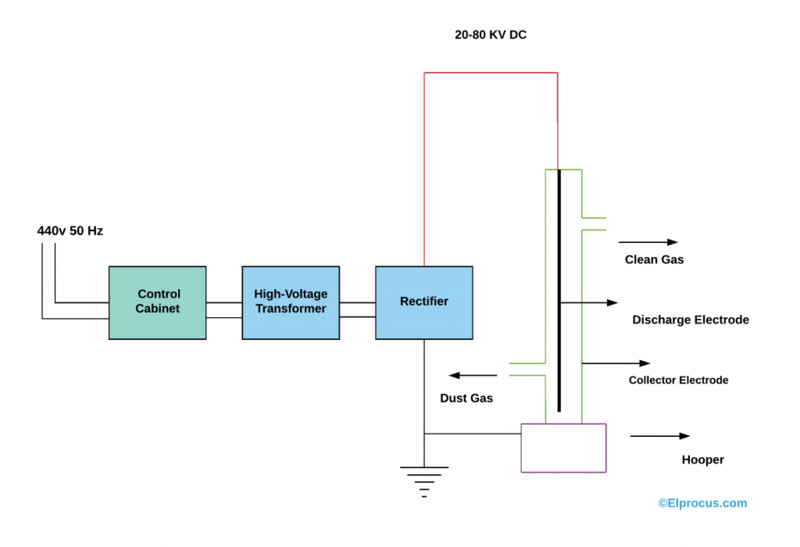 The efficiency of an ESP can be affected by the factors like power ratio of a corona, the collected dust resistivity, and the size of a particle. The efficiency of ESP can be calculated by the Deutsch Anderson equation. Where “η’ is the efficiency of fractional collection. “W’ is the velocity of drift terminal in m/s. ‘A’ is the collection of the total region in m2. ‘Q’ is the volumetric rate of air flow in m3/s. The advantages of electrostatic precipitator include the following. The disadvantages of electrostatic precipitator include the following. The applications of electrostatic precipitator include the following. The most common application of Electrostatic precipitator is an industrial application for a smoke. It looks like a gas; however, it is basically an accumulation of hard elements floating in the atmosphere. These elements can be excited, letting them be composed of enormous, commercial precipitators. The dry electrostatic precipitators are used for collecting dry particles like cement, ash, etc. The wet electrostatic precipitators are used for removing the wet particles like oil, tar, resin, acid, etc. Electrostatic Precipitators are used in steam plants for removing the dust from flue gases. Electrostatic Precipitators are used in machine shops and chemical plants for removing oil mists and acid mists. ESPs are used to remove the bacteria & fungus in the medical field. Thus, this is all about an overview of ESP or electrostatic precipitators. So, from the above information, we can conclude that the installation of ESPs in small-scale industries is complicated due to its cost. Although by the support of the government, the cost of the ESP’s will be decreased. By a good planning as well as land allotment the drawbacks can be negated. These devices are used for wet and dry pollutants. Therefore fixing ESPs in the power plants can get a lot of advantages to keep the atmosphere harmless. Here is a question for you, What are the different types of ESPs?